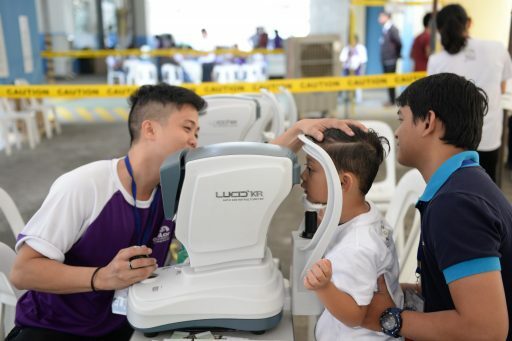 The Essilor Vision Foundation and the DELFINGEN Foundation partnered up for a second eye care initiative for DELFINGEN employees and their family members. The event took place in Cavite (Philippines). Around 300 people, coworkers and family members, were examined from 7.30am to 5pm. After having filled in a follow-up sheet, they were handed DELFINGEN Foundation shirts and started with the examination of their distance and close-range visual acuity. The examination included a second checkup using a refractometer for further analysis. With the supervision of an optometrist, pairs of glasses were given to people who needed it. They were able to choose the frame, and the lenses were mounted shortly after, so that they could have them on the same day. Eventually, children were offered a toy and the families had their picture taken in front of the photocall. A meal was offered in the cafeteria. At the same time, a reception was held for the 60 invited guests. After the welcoming speech of Philip Torres, General Manager of the DELFINGEN Philippines site, DELFINGEN Foundation’s President, Bernard Streit, introduced the Foundation’s actions. He was followed by Damien Personeni, DELFINGEN Executive Vice President, who introduced the company. To conclude the presentations, Essilor’s Managing Director, Patrick Martinet, introduced his company and the actions of Essilor Vision Foundation. We had the pleasure to welcome Nicolas Galey, the Ambassador of France to the Philippines who was given a tour of the location, from where the screening process took place to the production workshops. This was a successful day: around 200 people received glasses, some will receive them after a short delay. We would like to thank Essilor and DELFINGEN volunteers for the success of this event!